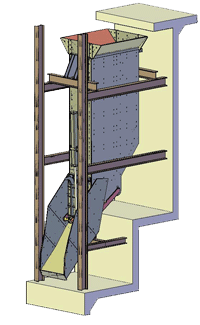 Meets ANSI/ASCE wind load and seismic requirements. Checkless design does not require load cell stays or check rods. Double cantilever design improves system performance and accuracy. Wear liners available to best suit your application (such as 500HS, rubber and Domite). Pneumatic or hydraulic operation, including complete control systems. Custom-built to suit your application, Variant Measuring Boxes can be used to load skips, haulage trucks, ore cars, and conveyors. They are pre-assembled and tested in the Variant manufacturing facility prior to shipment. Our volumetric measuring boxes are precisely dimensioned using material with accurate density and size to maintain an accurate payload measurement. Our gravimetric measuring boxes are supported on heavy duty load cells that provide a continuous accurate read-out. Size or density of material is no longer a critical factor.